I’ve had the pleasure of racing against Al since the late 70’s. He’s always been known for his consistency and percentage sailing where winning races is not as important as winning regattas. This year, he sailed with amazing consistency to win in the arguably most competitive fleet – the 68-boat fleet Standard Grand Masters. Here’s how we did it. They would finish the championship in this order. 2017 has been busy for me with my full time position at Royal Vancouver YC as their head coach. Duties including coaching our Laser / Radial high school aged sailors. Also I coached 29’ers at their Midwinters in March and Worlds in August. I particularly enjoyed these high level events with some very talented sailors. I love to learn about new boats and get all the pieces together to help them go fast the right way. The third component has been coaching some of our Race Team alumni, Kyle Martin in his Finn (Miami OCR and Sailing World Cup Final) and Isabella Bertold (Delta Lloyd and Worlds in Holland). I watched and competed in about 17 regattas, 8 major events in 2017. So I would say I saw plenty of high level sailing and have come up with over the years ideas how to get to the front of the fleet. My training for this years Worlds (Vacation time for me with my wife Sharon) was very minimal, I wasn’t sure I had the mental energy to attend but signed up believing that when the time came I would be excited to race. 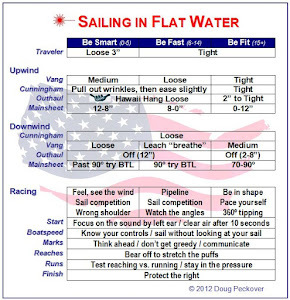 I did sail a local regatta in early July in Radials and then sailed the US Nationals in Lake Tahoe later that month. I was keeping in decent shape at my crossfit gym and riding my bike. On water training prior to the worlds was a few days in early September, then it was on the plane to Croatia with the idea of sailing at the site. I had chartered a private boat and was able to start practice Sunday September 17th, so with the practice race on the Saturday the 23rd, I had the week to work up to race trim. I bought a carbon top section and had a new sail, added my own hiking strap and compass (I use the compass quite a bit these days). Generally was quite happy with the boat (I really like the new boats from LP) and the gear by the end of the week. I have marks for my vang, outhaul and cunningham. I find that when I feel the boat is fast with certain adjustments I make a note of it and try to keep that in mind. 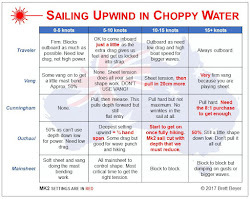 An example is I had 2 distinct marks on my vang for puffs and lulls in the 6-10 knots we sailed a lot in. 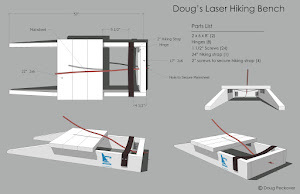 My outhaul marks are for upwind, a 1-5 scale on my deck. The practice race (I sailed one lap) went well and I had decided to start near the favoured end then go on the first shift. Andy Roy (CAN) was first off the pin then tacked, Peter Vessella (USA) was fast off the boat and I trailed both of them at the weather mark. I was in about 6th by the end of the run. Generally happy with my execution. The breeze was about 6 knots. One of the factors for this event became clear after the practice race. The sail out to the race course was going to be about an hour and a half each day with at least an hour sail in. The wind didn’t happen till about noon each day (if it happened at all) so we were going to have long days on the water with lots of waiting. As a coach I am used to this. The silver lining for me is that all the sailing out then in gave me plenty of time in the boat and I know that as I get the “feel” back I can be very quick in moderate wind in the Standard rig. I was training whenever I wasn’t racing. Also entering the harbour each day there was no wind so I had a chance to work on roll tacks and gybes. The first two days of the regatta (Sunday and Monday) we had no wind so there was a lot of catching up with old friends. Monday was cancelled early so after chatting with some of the guys I was walking home and noticed there was a late afternoon breeze so I went sailing for a few hours. I really like sailing everyday when I’m at these events, even for a short time. shifts upwind, but some good chances to pass going downwind. The Tuesday we had a decent sea breeze (12 knots) by the time racing started and many of the favourites were near the pin at go. Andy Roy was smokin’ fast in this start and I made up my mind to stay with him. This ended up being a recall. In the next start I was motivated to go hard near the pin again and was near Andy and a number of other favourites. I realized that my speed was good and my height also. I arrived first to the weather mark then sailed too conservatively on the run and rounded third. I fought through the race and was better on the final run, I had a 5 boat length lead down the final reach. Unfortunately I picked up a bag on my rudder and was passed by 2 boats. 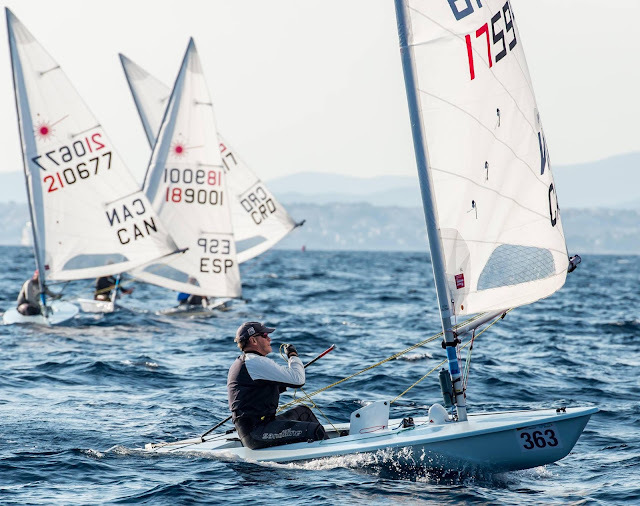 Race two I made adjustments and again was pleased with my speed, I won this race with a good gap and felt, as I sailed in that this was one of my best sailed first days at a masters worlds (nerves had been an issue), my self talk was to execute the game plan without fear. Keep the “what ifs” at bay. An example is don’t go to the lay line to early or have faith in the decision your making. Wednesday was slightly lighter wind but again 2 good races, I was a little too conservative in race one but was generally happy with a 4th, Andy won that race. The next race was Andy leading again at the top mark, I snuck into 2nd on the rounding, I sailed smarter on the run and rounded close behind Andy going out to the right. I hung with him (happy with my height) then decided to carry on after Andy tacked, this got me into the lead, I extended down the reach and won race 4. 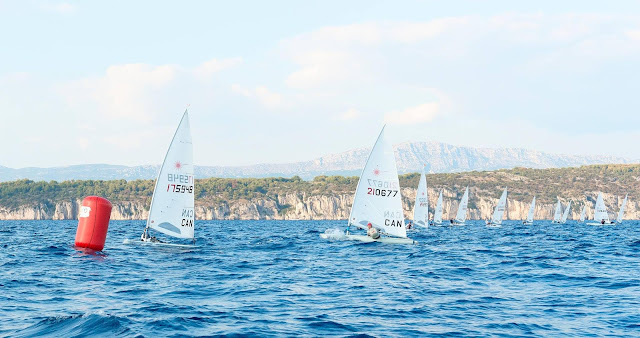 So after 2 days Andy Roy, Tomas Nordqvist (SWE), Peter Vessella (USA), Wolfgang Gerz (GER) and Nick Harrison (GBR) were all sailing well and the battle was on for the Championship. Thursday brought again little wind and lots of waiting on the water with one race. This turned into a pivotal race. I started near the pin even though my compass was saying square line, even a bit boat favoured, it never came back from this and with plenty of scrambling ended with a 10th. Andy sailed a nice race and could have led but a big righty came in late up the first beat, and Tomas won this race. So now we have a close battle for the podium, with others ready to pounce. I decided that generally this race was one that I left the game plan and that I would ignore it and focus on the good races I had sailed. Friday no racing, we actually had a breeze come up but ended up being too unstable and with the 175 Standard rigs on the course, we needed 2 hours to get in before sunset, pressure was building. There were a number of sailors that thought I had it won because the forecast for the last day was poor and there would be no racing after 3. I kept to the routine and sailed out to the race course on Saturday. I will say that the long waits and the broken up regatta between races was difficult and I was pleased that I entered the final race with a positive mindset. I was determined to be on my front foot going hard, same as all the races that I did well in. We had one race with a late moderate sea breeze that was enough for me to be in the hiking strap (always good). I had a midline start that turned into a decent rounding at the weather mark (5th), I passed Tomas on the run and headed left in 4th with the two leaders well ahead. Tacking on the shifts up the beat (many were going left), I gained and was close in 3rd with a good gap to the rest of the fleet. Andy and Tomas now had their own battle going on for third place overall, and I only had to keep my head. I ended 2nd in the race and was relieved that I had not let myself down by sailing poorly but had risen to the occasion. Andy did what he had to with Tomas ending 2nd overall, Tomas 3rd. My post mortem for the event is that the psychological aspects of competing are of utmost importance. There are a number of factors that helped me succeed - boatspeed and height (when needed), executing quality starts, solid lane sailing tactics on the first beat, aggressive tactics on the run, hitting shifts on the second beat (and remembering that what seemed to work on the first beat doesn’t always work on the 2nd), pushing hard to the finish. It was amazing how much nicer it is to have a countryman and friend (Andy Roy) nearby on the racecourse when I wasn’t sure about a strategy. We fed off each other in terms of confidence, discussing tactics etc. at the end of each day. Looking forward to the Worlds in Ireland next September. Seems so easy when he writes it up! Congratulations to Al on being Canadian sailor off the month.